Well, after carping in the last entry about the dart board location at Roots, Dave and I were lucky enough to waltz in for pub night Tuesday evening and get the table under the dartboard. We must be living right. I still wish they had a better location for it. Dave had the upper hand at darts, but it's hard not to be content with pints of Festivus and a glass of Epic on the table. Turns out the Epic that's on tap right now is not the one brewed and bottled this season, it's the 2006 Epic. I just assumed it would be the new one: thanks to Lindsey for being sharp-eyed enough to figure that one out. Does that mean the Epic they were pouring last year was a year old -- the 2005? We must be living right to have a place like Roots in town. Carla bought me one of the huge jeroboams of the 2006 last year for my 40th birthday. That's a perfect gift: something I'll open to great fanfare in a few years, but which I never would have bought myself. I remember trying to haggle the price down on the last 2005 Epic jeroboam as it sat on the bar week after week, but they wouldn't budge and I'm too cheap. Interestingly, that 2005 bottle has reappeared on the bar recently, but Jim the bartender says the brewers disagree on whether it was handled carefully enough to still be good. I hope basement storage is careful enough for my 2006. The one that's on tap right now is tasty indeed: smooth and very sweet, with flavors like maple and cherry. I don't really keep mine behind the shovels. A jeroboam holds 3 liters according to the Internet. The label on this one says 95.4 fluid ounces, which is less than 3 liters, but I'm not complaining. It's still going to take a lot of help to empty that sucker. This year's Epic is bottled in 1.5 liter magnums. That's a good idea, it cuts the price in half (to $40), it's easier to store, it's easier to use up when you eventually open it. Still, the jeroboams were quite a statement -- 10 out of 10 for style, as Zaphod Beeblebrox said. You've got to admire the audacity of it. Last year Roots had both the '05 and '06 Epic on tap; one of them might have even been on cask (or maybe that was the Wee Heavy). 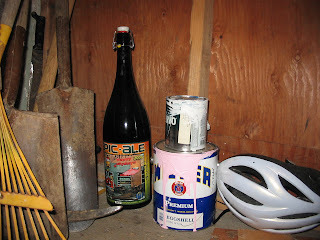 My j-bomb of '06 Epic is also stored next to Miller Paint cans...great minds at work. Yeah, but what kind of shovels do you have? Man, I miss that Wee Heavy.